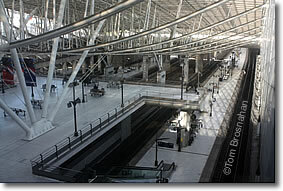 The Aérogare 2 train station at Paris-Charles de Gaulle Airport is where you board TGV intercity trains as well as RER B trains to the center of Paris. Aérogare 2 is the main train station at Paris-Charles de Gaulle Airport. If you see signs in the airport pointing you to the Gare or Gare SNCF or Paris par train, they're probably pointing you toward Aérogare 2 between Terminals 2C and 2E (map). This is the only place at the airport where you can board an SNCF TGV or Intercités train to another city in France or in Europe. Aérogare 2 is a big, busy three-level train station with electronic displays showing train arrivals and departures, tickets sales by both ticket agents and automated ticket machines, a train information office, a Salle d'Attente (waiting room) with public toilets and diaper-changing facilities, free Wifi Internet, and plenty of French-style 220-volt, 50 Mhz electrical outlets so you can charge your mobile phone and laptop. Here's all about RER Line B trains from Paris-Charles de Gaulle Airport to the center of Paris. Here's how to choose an RER B train to the center of Paris. Here's how to buy your RER B train tickets. Here's how to avoid ripoffs in currency exchange. at Paris-Charles de Gaulle Airport.